On Monday morning, a group of what the Cantonment police describe as between 400 to 500 BJP workers took out a demonstration to the gate of the Secretariat. 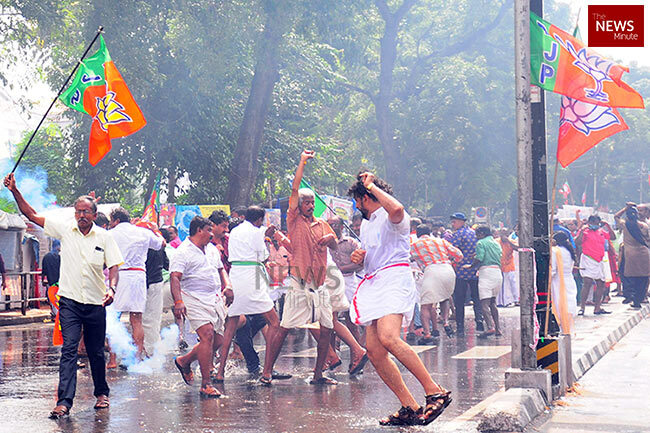 The BJP in Thiruvananthapuram has called for a hartal in the capital city of Thiruvananthapuram tomorrow. BJP says the hartal has been called due to the the police’s high-handed response to a protest by the party and its youth wing Yuva Morcha, which took place outside Secretariat on Monday morning. The hartal called by the BJP will be in place from 6 AM to 6 PM on Tuesday. 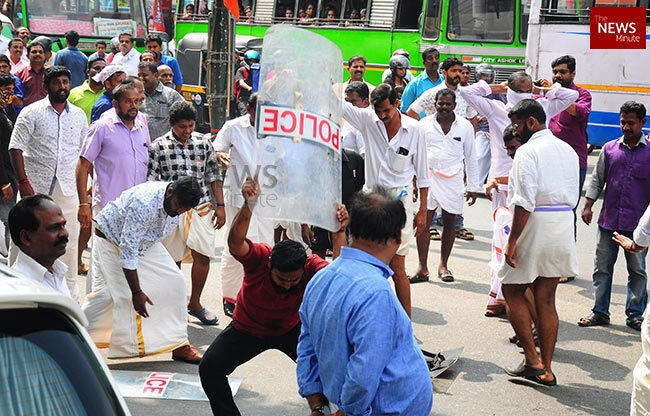 BJP leaders have said that it would be a peaceful hartal and have also asked the Kerala government to take action against the police force alleging male police personnel had targeted women protesters. Twelve BJP supporters have been hospitalised including a woman who sustained injuries, said party leaders. On Monday morning, a group of what the Cantonment police describe as between 400 to 500 BJP workers took out a demonstration to the gate of the Secretariat to protest the government’s handling of the Sabarimala temple women’s entry issue, and in support of BJP leader AN Radhakrishnan. AN Radhakrishnan is on the 8th day of his hunger strike outside the Secretariat, protesting the government’s treatment of BJP General Secretary K Surendran (who was released from jail on Saturday) and to demand the revocation of the imposition of curfew under sec 144 at Sabarimala. The protesters, from the BJP and Yuva Morcha, including women members of the group, got into a verbal confrontation with police officials posted there. When the officers attempted to disperse the protesters for trying to enter the Secretariat, a small group of protesters began to throw stones at the police, following which the police retaliated with the use of water cannons and tear gas grenades. Sandeep, a BJP Public Relations Officer, told TNM that the protest had been called in particular to protest the allegedly violent treatment of women protesters by the police. A Cantonment police official that it was a small confrontation between protesters and the police, and claimed that it was handled as deemed appropriate by the police. Meanwhile, AN Radhakrishnan’s health has been failing and he could be shifted to a hospital on Monday. Central Minister Alphons Kannathanam visited the BJP’s protest site and asked the government to lift Section 144 in Sabarimala. The imposition of curfew under sec 144 at Sabarimala has been a source of particular ire to various political groups in Kerala. 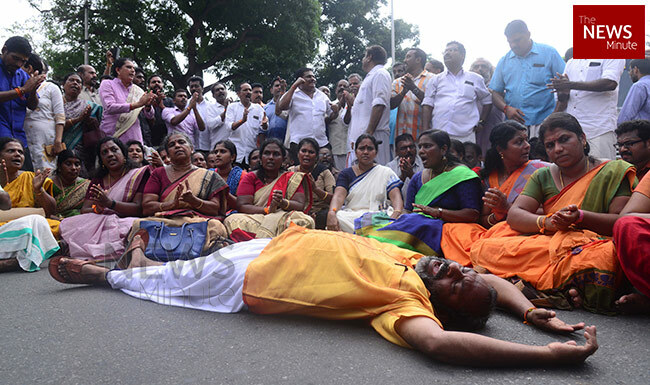 Various UDF MLAs have been disrupting the ongoing Assembly sessions, causing the sessions to be adjourned in just a few minutes, and boycotting government events, including the swearing in of new Water Resources Minister K Krishnankutty, in protest against the imposition of curfew. BJP leaders have also taken out various demonstrations and protests, at Sabarimala and in the capital city, to protest the imposition of curfew.